The birds are chirping, trees are budding, glimpses of green leaves are apparent here and there, and the sun is shining – finally! 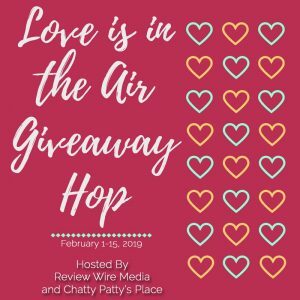 We are saying hello to spring with a fun giveaway just for you. Enjoy cooking with and growing your own fresh parsley, basil and chives with this fabulous Herb Trio Grow Kit from TotalGreen Holland. 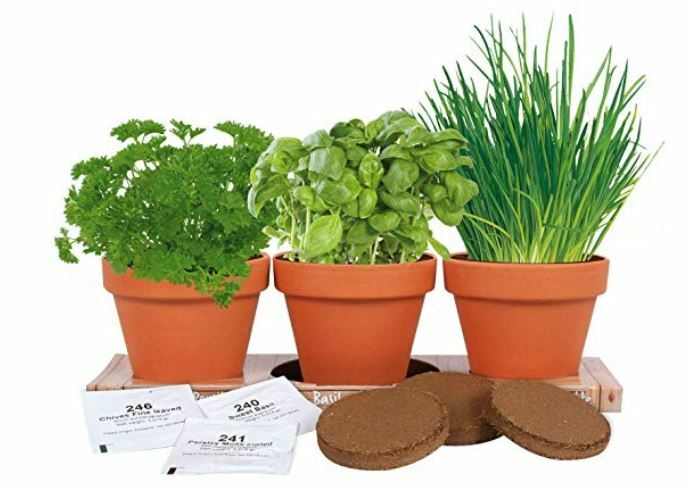 It comes neatly boxed, containing three terra cotta planters, premium peat pellets with nutrients (activated by water), and three seed packets (non-GMO) ready for planting and growing your own basil, parsley and chives to enjoy in your favorite recipes. Enjoy the benefits of growing your own herbs in the comfort of your kitchen – always have them fresh and easy-at-hand, try new combinations of flavors in your favorite dishes, know that you don’t have to worry about harmful pesticides or contaminants, and enjoy the fresh green splash of color on the window sill. Make some fresh pesto with your basil. Enjoy the fresh parsley in these Baby Potatoes with Parsley and Lemon Butter. Add some fresh chives to top off that baked potato or tray of nachos, or try them in this Mashed Cauliflower with Parmesan and Chives recipe. 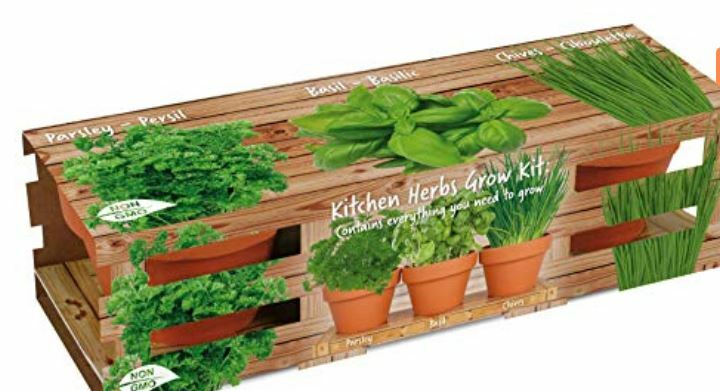 What dish would you make with these fresh herbs? 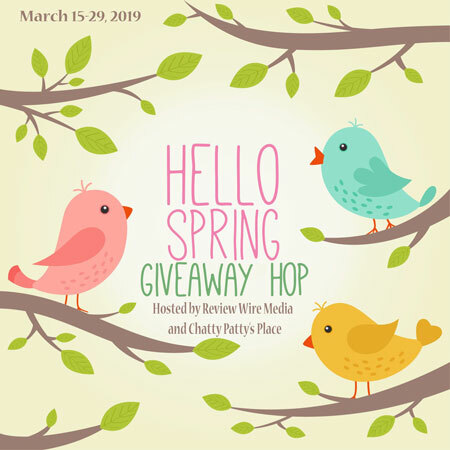 We are also delighted to be a part of the Hello Spring Giveaway Hop with a crew of other blogs, so please check out their giveaways below after entering for your chance to win the herb garden kit here on Dish Dish. 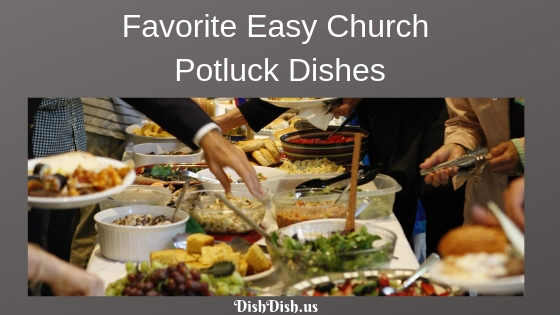 Growing up in the south, church potlucks were a part of our regular routine. It didn’t even have to be a holiday or special occasion (which, of course, pretty much required a good potluck dinner or “dinner on the grounds”). Potluck dinners were so much fun – lots of time to visit, catch up and share with people, getting to know each other better and enjoying community. Sometimes there would be games and music, too. And, of course, there was always plenty of desserts! In case you haven’t been to a potluck dinner before (or haven’t taken a dish to one) and aren’t sure where to start, these favorite (mostly easy) dishes and recipes are the perfect place to start. And at the end, we share a few hacks for easily transporting food for your potluck dinner. Broccoli Grape Pasta Salad is a tremendous dish (plan to make-ahead the night before or earlier in the day since it needs to chill for 3 hours before serving) for a potluck. 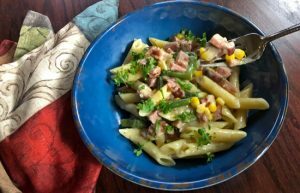 It’s colorful and full of a wide variety of flavor with crumbled bacon, pecans, and a creamy red-wine dressing. Use the crockpot to dish up this delicious Mexican (or Spanish) Rice for a crowd (image by Practical Stewardship). With only a few ingredients — some onion, peppers and tomatoes with broth, seasoning, and rice — you have an easy filling side dish. Baked Spaghetti is a wonderful dish for a potluck; this version is layered with cheesy goodness for a taste similar to lasagna (with a lot less work). and Worcestershire sauce, layered with ham and Swiss cheese, baked to perfection. So yummy! 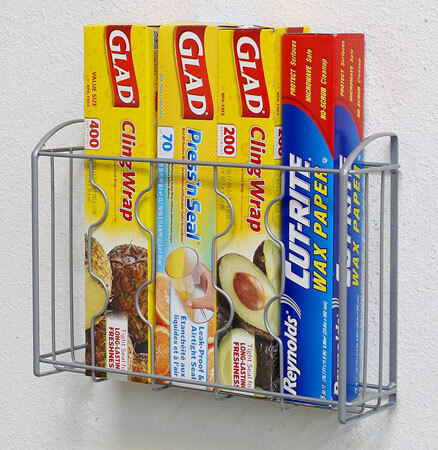 easy to put together and easy to transport, as well as perfect for a crowd. For dessert, a Chocolate Sheet Cake baked in a jelly-roll pan (feeds a decent crowd) and is topped while still warm with drizzly chocolate icing. It’s always a hit! 1. 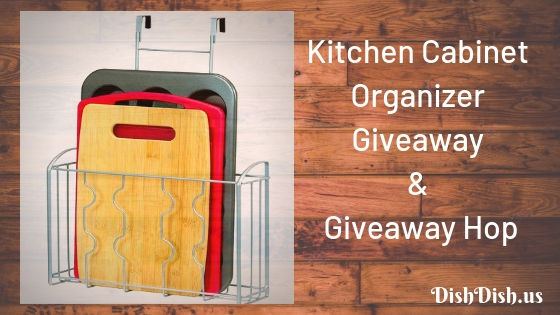 Place your crockpot into a laundry basket lined with towels to easily transport without making a mess. 2. 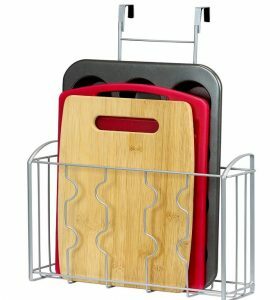 When transporting dishes in foil pans, place same size foil pan on top of the one carrying your food, and clip them together with binder clips to secure. 3. Bring a frozen ice pack (or two) wrapped in towels and tuck them under your dish to keep it cold. 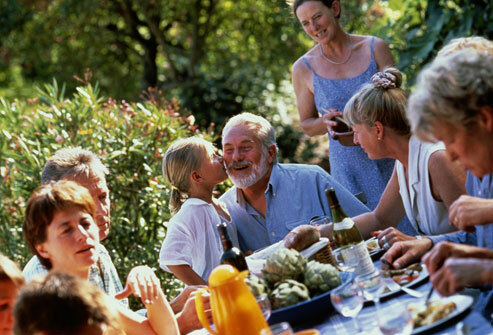 Do you have fond memories of potluck dinners? What are your favorite potluck dishes (to eat or bring)? We look forward to hearing from you in the comments below. 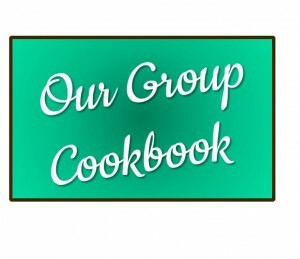 And if your church or community group would like to collect recipes to share online, we’d love to help with your digital cookbook project so you can share recipes any time, any place. There’s something so comforting about a home-cooked meal especially in the winter – you know, those days when you just want to bundle up, stay indoors (or come in after being outdoors) and warm up with comfort food in front of a cozy fireplace? Sometimes if the winter drags on, though, it can be difficult to find the inspiration to get another meal on the table for everyone. 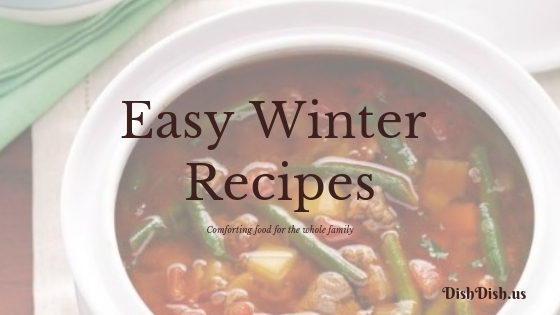 So we are jumping in with some of our favorite easy winter recipe ideas for your dinner table this week. This hearty soup is an easy crockpot or slow cooker meal with fresh vegetables and ground beef or turkey. Cook beef (or turkey) with onion in a skillet over medium heat until meat is no longer pink; drain. Add all ingredients with cooked ground meat into crock pot or slow cooker, and cook on High for 4 hours or Low for 8 hours until cooked through. I love the creamy texture of this dish; if you don’t want to cube the chicken before cooking (I don’t like to do that part), then just let it cook and pull it out before serving so you can chop it up a bit before putting back in the stew. Toss all the ingredients in the slow cooker for the day and serve over split biscuits for a hearty, comforting meal at the end of the day. Combine all ingredients in slow cooker, and cook on High for 5-6 hours. Serve over freshly baked biscuits for that pot pie flavor. I like that this dish incorporates the flavors of beef stroganoff without requiring the long cook time generally needed to tenderize cuts of beef for a traditional stroganoff dish. This tasty casserole is made with ground beef, noodles and mushrooms in a creamy beef sauce and some mozzarella cheese thrown in for a cheesy twist. Preheat oven to 350 degrees F; spray baking dish with cooking spray. Cook noodles according to package directions. In a skillet over medium heat, cook oil, onions, garlic and thyme for about 2 minutes; add mushrooms and cook for 5 minutes, then add beef and cook until it is no longer pink. Season with salt, pepper and Italian seasoning. Add broth and Worcestershire sauce and stir for 2 minutes. Remove from heat, stir in sour cream, noodles, and half of mozzarella. Pour into prepared baking dish and sprinkle with remaining cheese. Cover with foil and bake for 25 minutes; remove foil and bake 10 minutes more until lightly browned. 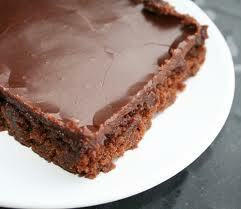 What comforting food dishes do you and your family enjoy especially in the winter time? Do you have some terrific ideas or tips to share? We love hearing your feedback and thoughts in the comments below. Leave us a note! Making healthy choices for myself and my family can sometimes seem arduous or overwhelming (where to start and how to stay consistent). However, I find it’s easier to move towards a healthy lifestyle by breaking it down into small steps I can take (whether personally or for my whole family), so the steps are manageable and things I will be able to maintain long-term (instead of jumping on each bandwagon of extreme dieting and lifestyle changes). How about you? 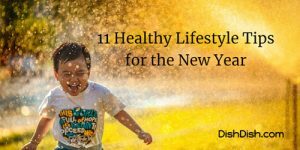 If you too are looking for small changes in the right direction for a healthier you and happier family, these tips will definitely help you (and me) get started! Drink 2 more glasses of water each day than you are drinking now (if you aren’t drinking enough water) – try to add one to your morning routine and one to your afternoon or evening, at the least. Since I am not a fan of plain water, I often drink mine with a little lemon or orange essential oil or a slice of lemon, lime, or orange to add a little pizzazz. You can even make up a whole pitcher of water with fruit slices or berries and keep it on hand for yourself and the kids to enjoy throughout the day. Start your day by listing 3 things (or more) for which you are grateful. There is just something about starting the day with a positive, uplifting perspective and attitude, which can easily be jump-started by pausing to think about the good things in our life at the moment (all of us have at least 3, right?). Walk for 10 minutes. When we’re not in the habit of exercising and starting a whole new program seems daunting, starting with 10 minutes a day can seem manageable (especially since you already have to walk around each day). If the weather is great, it’s wonderful to step outdoors for a brief walk; and if not, set a timer and walk indoors (up and down the stairs, around the house, around the shopping center or office, etc.). Choose to laugh and smile. Sometimes it’s easy to get caught up in the responsibilities of the day and not even allow ourselves to laugh or smile at the funny moments or interesting situations around us. Look for an opportunity to do so – and I promise you’ll feel better! Eat at least one more home-cooked meal for dinner each week. Eating in is healthier for us, and cooking and eating together as a family (or with friends) is good for our relationships and souls. If you don’t like to cook usually – start with one simple meal (something like spaghetti or tacos or pizza with a store-bought crust). If you’re ambitious, you could download our Quick and Easy Meal Plan that gives you 6 dinner recipes for each week along with a snack and dessert, complete with the grocery list needed for that week as well. Skillet Lasagna Recipe – dish up a quick, easy dinner this week (serves 4). Heat olive oil in a skillet. Cook ground beef with garlic until beef is cooked through; drain off the grease. Stir in marinara sauce, Italian seasoning, salt and pepper. Turn heat down to low and simmer for 15 minutes; meanwhile, cook bow tie pasta in saucepan of salted water until cooked al dente (about 7 or 8 minutes). Stir sour cream into beef and sauce, then throw mozzarella and cooked pasta into sauce, stirring well. If desired, garnish with chopped fresh basil. Add a couple of vegetable servings to your day. Pick a couple of vegetables you like the most, and add one of those to your lunch or dinner plate. Start small, and add on later. Toss 1 pound of fresh green beans (cleaned and snapped) with a little bit of olive oil, salt and pepper. Place on foil-lined baking sheet in 450 degree F oven for 15-20 minutes. During last 10 minutes of roasting, add 1 pint of grape tomatoes to pan with green beans. When beans have reached desired tenderness, toss beans and tomatoes with 1 cup of feta cheese (marinated, if desired) and serve. Reduce the plate size for meals. If you’re struggling with overeating at meals, start with a smaller plate and stick with one helping. It’s the little things that make a difference over time. This way you can still enjoy your favorite foods, but eating a little less of them will help you feel better. Enjoy some time with friends. It doesn’t have to be complicated or expensive. Plan once or twice a month to enjoy dinner together or meet up for a hike or game night. Laughing together, catching up on how things are going for everyone, and encouraging each other through the ups and downs of life – it’s worth it! It seems like so many of us live in a neighborhood where everyone comes home from work, closes the garage door, and doesn’t set foot outside again until they leave for work in the morning. Be a good neighbor and meet a new neighbor or two on your block. Take over a treat or a plant (it doesn’t have to be anything expensive), introduce yourself, and get to know them. You may find a new best friend (or at least have someone you can call if you need to borrow some flour or sugar). Do you have a hobby or activity that you really enjoy, but always gets lost in the shuffle because responsibilities take priority? Choose to intentionally allow yourself time to enjoy that activity a little bit each day or at least once a week (depending on the activity and time required). It’s great to have something to feed our soul like that, experiencing the joy of doing something we love, and it provides an outlet for relieving stress, being creative, and giving our brains a break from “work”. It’s important for our well-being that we keep learning new things. It can be something small – peel and mince garlic, cook a spaghetti squash, etc. Or something bigger – learning to swim or speak a new language or an entirely new career. But starting small is fine – pick one thing new to learn each week or each month and enjoy a whole new world! Do you have other ideas or suggestions for healthy lifestyle? We would love to hear your thoughts, too, in the comments below. Thanks for stopping by! Take a deep breath and enjoy some of these favorite holiday meals with your loved ones, for Hanukkah, Christmas, the New Year, and more … whether you love planning a complex meal or are simply looking for ideas to stay in the groove of family meals around the table amidst all the hustle and bustle (or need something easy to take on the road with you), we have some great recipe ideas just for you! This is an amazing colorful grilled dish of skewered chicken and sausage served on a platter with roasted peppers, onions, and skillet-fried potatoes drizzled with homemade Sicilian Herb Vinaigrette. If you have a little extra time and want to create a wonderful presentation dinner that’s also full of intense flavor, this is the dish for your family (recruit some help with the chopping, dicing, mixing – and make it a family night event). Colorful platter presentation with a layer of green beans and basil with shallots topped with roasted salmon and a sprinkle of basil leaves for garnish. It’s a very simple dish to make, but also beautiful to present for guests or as the centerpiece of your family dinner night. Here is a super easy dish with sauteed diced ham, frozen green beans and corn, pasta and seasonings in a creamy sauce. It’s amazingly quick to put together, and serves up a hearty meal the whole family will enjoy! If you are longing for some comfort food — like an old-fashioned chicken pot pie — this one is a quick simple substitute using frozen mixed vegetables, canned soup, and chopped chicken topped with Bisquick batter or canned biscuits. Great use for leftover cooked chicken or chopped deli chicken. Sauteed veggies, chicken and sausage, are baked in the oven with rice and seasonings for a one-pot meal that’s easy for taking along to a potluck or large family gathering. Sliced sausage links with simple canned beans and fresh BBQ seasonings along with collard greens provides a healthy, delicious, easy take-along meal. Pork shoulder roast cooks all day in the crockpot with green chilies and seasonings; just pull apart and serve as tacos, sandwiches, or with veggies and rice for a full meal. 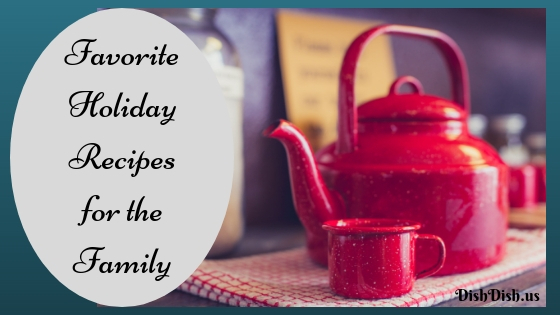 Does your family have holiday meal traditions? Are you looking for dinner or meal recipe ideas for particular circumstances? We’d love to hear from you in the comments below – ideas, suggestions, questions — all are welcome. 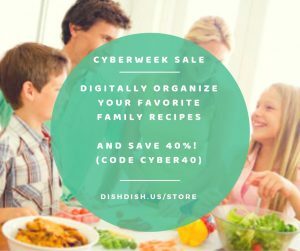 We are grateful for those of you who have become family with us here at Dish Dish and have engaged with our heart for inspiring and helping families to pass along the legacy of family cooking, recipes, food and holiday traditions to the next generation, shared around the world with digitally collected and organized recipes for the whole family. 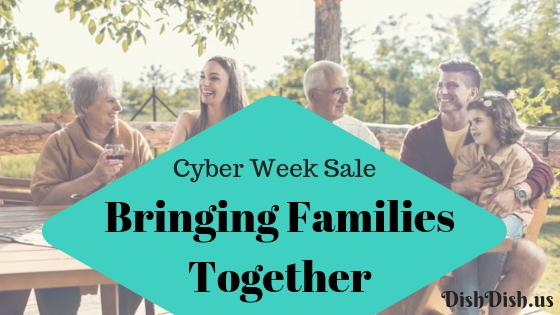 Often we hear of the tremendous benefits for families – in regards to physical, emotional and mental health — of eating dinner together around the family table, sharing not only a meal, but the thoughts, frustrations and joys of the day together. It’s a reminder that we aren’t alone, that others have struggles just like ours, and that together life is better. 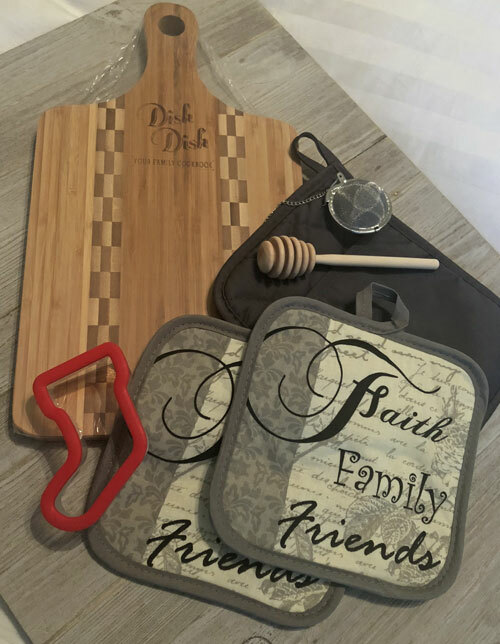 So we encourage you to take a little bit of time, cook a simple meal together with loved ones, sit down around the table to enjoy the food and fellowship, and remember how good it feels to take a deep breath and enjoy the time with each other. 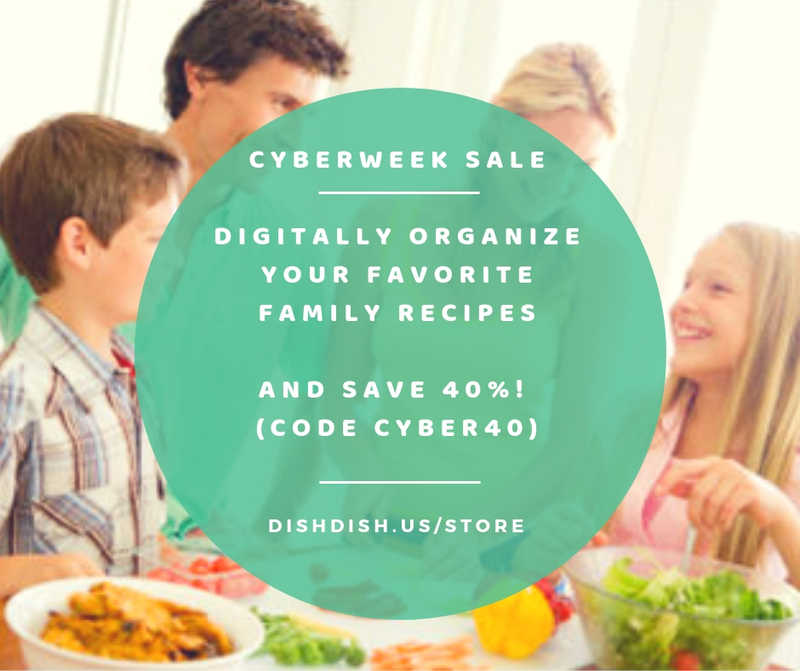 This week take advantage of our discount (use code Cyber40) to get your entire box, drawer or closet of family recipes organized digitally online (so all the family members can share and enjoy wherever they are) with our Digital Recipe Album or the Concierge Offer packages. And we’d love to hear from you – if you have ideas, suggestions, comments – what you love about sharing recipes on Dish Dish, how your family enjoys meals together, whether you still have grandma’s recipe box and fond memories of holiday foodie traditions with the whole family. Do you have a friend who has a drawer full of recipes, or a lifetime collection that they would enjoy having digitally organized for easy searching, access, and sharing with friends? Feel free to pass along the discount to them, too! Thank you for stopping by today and sharing your time with us. We wish you a merry holiday season and the best of times with family and friends. 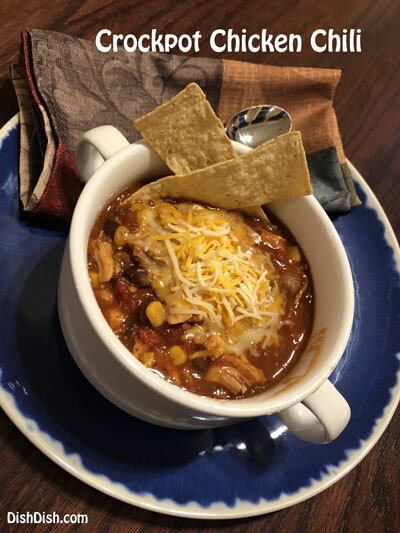 Crockpot Chicken Chili – it’s the perfect blend of easy and delicious with simple ingredients. I love that I can throw the chicken in there still frozen (if it’s early in the day) or thawed (if I remembered to take it out of the freezer earlier or used the microwave to defrost) and still have a wonderful home-cooked meal in time for dinner for the whole gang. 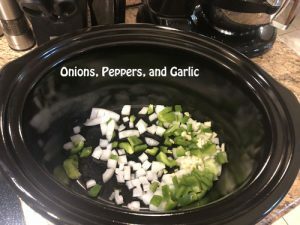 Using the crockpot or slow-cooker means I have a lot less clean-up for the meal than otherwise, and this soup goes great with some tortilla chips (so there’s no bread to bake to go with it, either). In our house full of boys – there is almost always some kind of bread to go with dinner, especially if we’re having soup. But I digress. 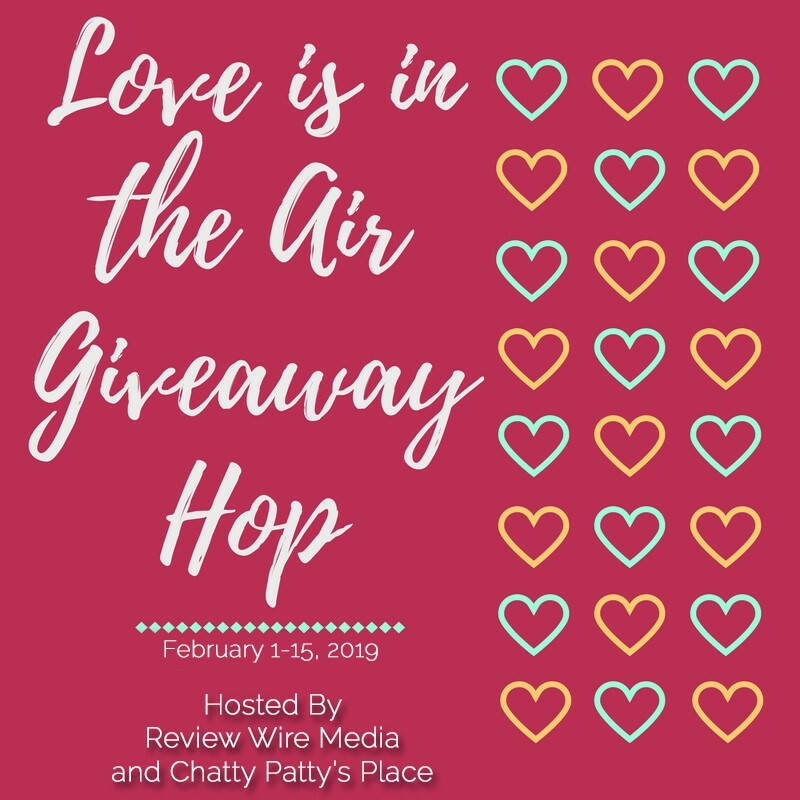 Grab your crockpot, some fresh or frozen chicken cutlets, and let’s get started! 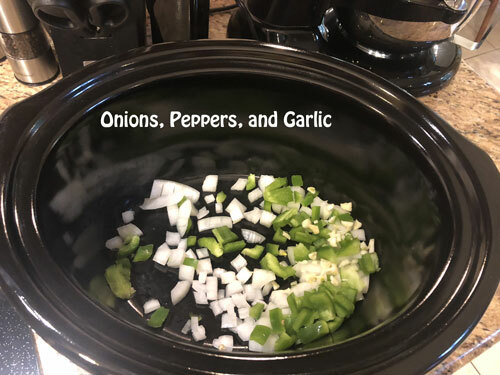 Chop some onion, green bell pepper and garlic, and toss it in the bottom of your crockpot. Layer the chicken pieces over the top of the vegetables, and season the chicken pieces with cumin, chili powder, fajita seasoning, salt and pepper (as much or as little as you prefer). 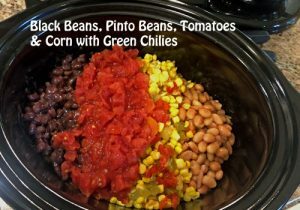 Over all of this, pour one can each of black beans, pinto beans, diced tomatoes, Mexican corn or plain corn, and tomato sauce. Gently pour one to two cups of chicken broth or stock over all (I used one cup when cooking for 4 hours – if you’re leaving it for 8 hours or more, I’d use 2 cups so that it keeps enough liquid). If chicken is frozen, set crockpot on low heat for 8 hours; if you’re using thawed chicken pieces, cook on High for 4 hours (or low for 8 hours if you need to leave it all day). When you’re about ready to serve, pull out the chicken pieces and chop or shred them before placing back in crockpot. Serve in large bowls and garnish with sour cream, shredded cheese, tortilla chips, jalapenos, green onions, or any other topping your family enjoys. This chili was so delicious, and the whole family enjoyed. I love that there’s very little chopping or prep, as well as clean up. And it’s great for a large group! 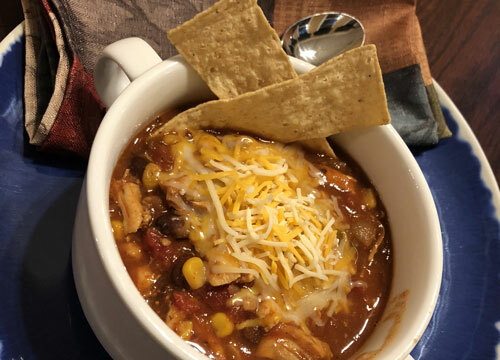 (See entire printable, shareable Crockpot Chicken Chili recipe here). 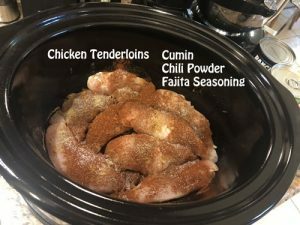 What else do you like to include in chicken chili? What is your family’s favorite garnish for a dish like this? Please take a moment and leave us a comment below – we love hearing what you think! Visit Dish Dish's profile on Pinterest.